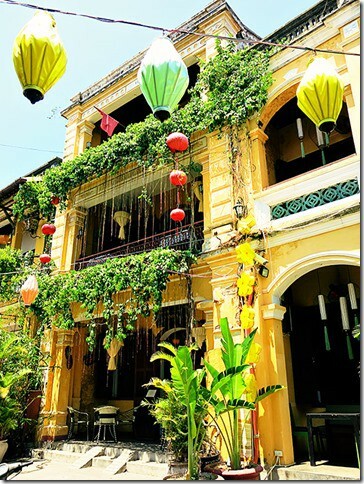 The Enchanting Ancient City of Lanterns in Vietnam - Hoi An Old Town! 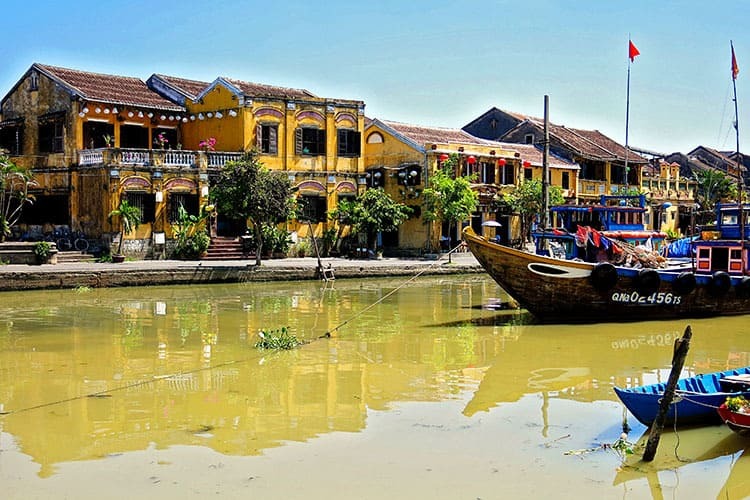 Welcome to the beautiful Hoi An Old Town, the town that you will fall in love with! Join in on the fun with thousands of happy travelers. Check the best of Hoi An on your unforgettable cultural adventure to the heart of Hoi An Ancient Town. Find out how to get there, where to stay, what to eat and above all what you just need to experience on your visit here! We love Hoi An and we keep on going back every few years for another dose of the amazing Hoi An vibe! For us, the magic here never stops. This place has a special place in our hearts and I hope that you will feel the same once you visit here! Awaken your sense of sight as you try to absorb the colours, lanterns, bougainvillea flowers and patterns found in abundance within the town streets. Awaken your sense of sound as you try to absorb the sound of languages spoken from tourists right around the world; the sound of oil sizzling away as street food cooks away; the sound of the store owners begging you to ‘buy from me’. Awaken your sense of taste as your taste buds will be challenged and tantalized by flavours and herbs and seasoning combination you never knew before. 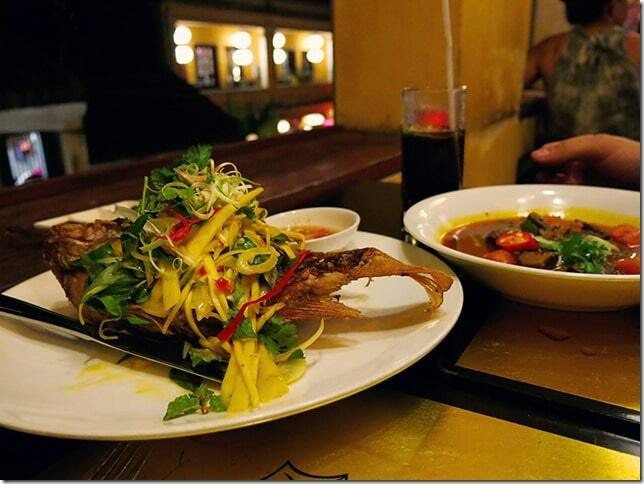 Here in Hoi An we found the best food throughout our travels in Vietnam, my mouth is simply yearning for more!! Awaken your sense of smell as you smell the air of an Asian country, smell the wafts of food that you are unfamiliar with. Awaken your sense of touch as you try to feel the curves and dents of a town that dates back to the 16th century. This section of Hoi An has surviving wooden structures and a street plan that is still original and intact and together present a traditional townscape of the 17th and 18th centuries. It is no wonder that it has been titled as a UNESCO World Heritage Site! To feel something so old, filled with so much history and stories to tell …. that touch is hard to describe!!! Regardless, this Ancient Town left us questioning out loud whether it is simply now just an ‘’Ancient Town Theme Park’’ for tourists!?? We felt that you had to look so much harder to find the authenticity that we fell in love with in various other regions of Vietnam. Here we got a bit overwhelmed with the ‘buy from me’ and the ‘me make tailor clothes for you’. The stores you will pass by as you wander down these ancient streets are either trinkets and souvenirs, shoes or clothes and repeat and repeat again and repeat some more!! Throw in some tea houses and cafe joints and you have everything to keep tourists happy. Even the friendliness in Hoi An felt pressed and pushed to us … everyone trying to be your friend all with the main goal in mind of steering you towards some tailor shop. A Theme Park?? … yes, we think so. But don’t stop reading here and don’t cross this little piece of Hoi An town off your list ..Why?? City of Lanterns Hoi An. Because regardless of Hoi An Ancient Town screaming for tourism, we still fell in love with this town! We still place Hoi An as one of our favourite destinations of our trip to Vietnam. And we would still urge everybody and anybody to go and see the charm and experience the atmosphere found here! Where else do you find bright yellow screaming out down hallways and alleys! Where else do you find lanterns strung above your head, from one side of the alley to the other. 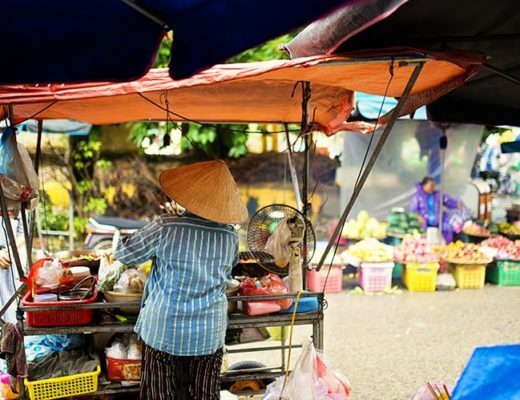 Visiting Hoi An should be high on your list, but if it is the authenticity of the Vietnamese culture you are chasing, we really suggest you pop some other destinations such as Sapa or Hanoi on your list as well! 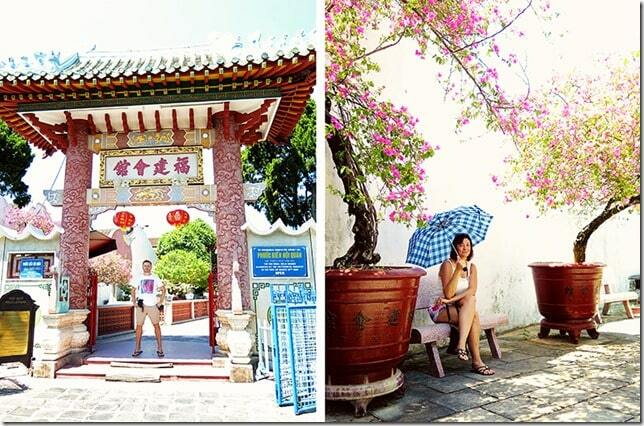 Where is Hoi An Ancient Town? 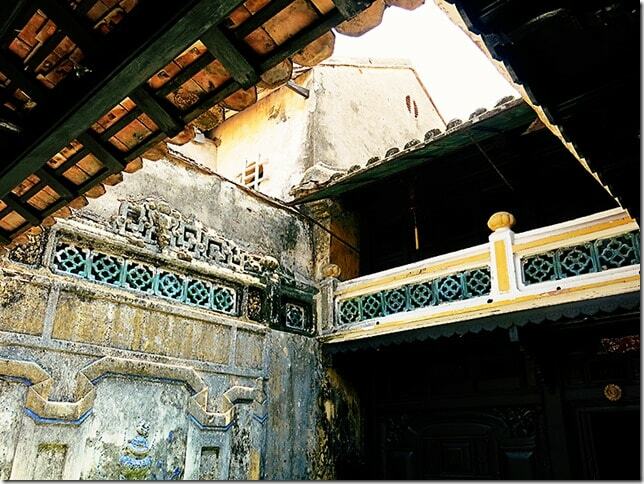 Where is Hoi An Old Town (Ancient Town)? Hoi An Ancient town is located in Vietnam’s central Quang Nam Province, on the north bank near the mouth of the Thu Bon River. Hoi An Ancient town makes up only a pretty small part of the bigger Hoi An town. 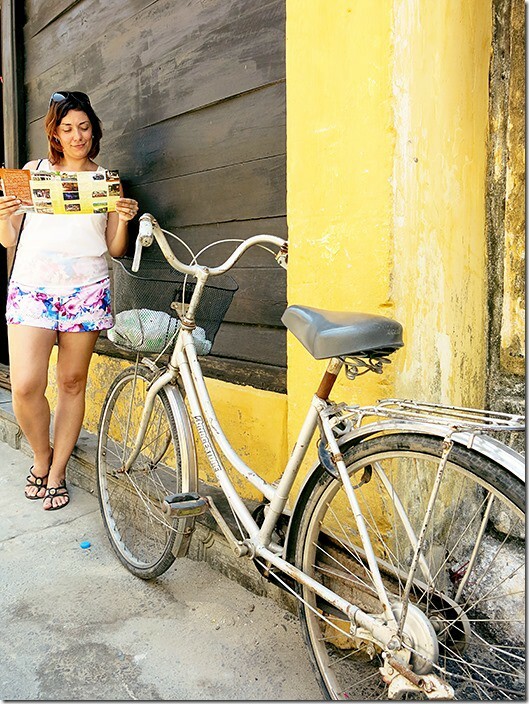 We never realized that the photos of Hoi An you find all over the internet is pretty much taken on a few streets. According to UNESCO the ancient town comprises a well-preserved complex of 1,107 timber frame buildings and because of it’s UNESCO Heritage Site title, within these few streets, you will find no cars. Walkers and bicycle riders are welcome on the alleys and lanes throughout the whole day, whilst scooters are only allowed in the town within time-limited periods. 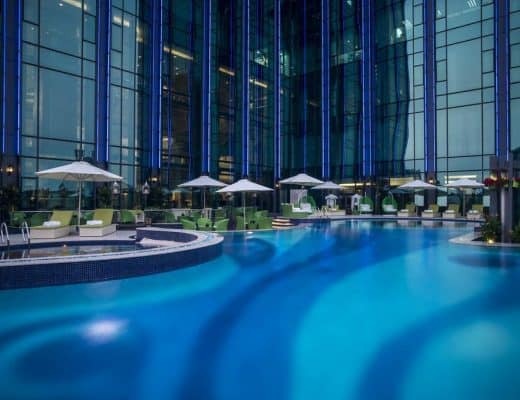 The best way to get to Hoi An is, of course, by plane and the closest airport is Danang Airport, which is only a 40 minutes drive away from Hoi An. If you would like to find out the best way to get to Hoi An from Danang or if you are making your way to Hoi An from Hanoi, then check out the links below. Find out more on how to get from Danang to Hoi An. Find out more on how to get from Hanoi to Hoi An. Here on the map below, you can see the portion of Hoi An Ancient Town map (Indicated by the beige colour on the streets). Don't worry too much about trying to print this map though. Every hotel that you stay at will be able to provide you with a map. Alternatively, you will be able to grab one at one of the entrances as well. Map of Hoi An – Old Town Hoi An map. Tickets to enter Hoi An Old Town will set you back by 120,000 Dong per person. You only need to purchase a ticket once during your stay, so make sure to hold on to this ticket and carry it with you if you wish to visit on multiple days. The ticket will also give you access to 5 out of the 22 highlighted places and streets to visit in the Old town. Located at point 46 on your map. This assembly hall is one out of 5 in Hoi An, but most tourists and Vietnamese declare this one to the most beautiful and prominent. We loved our stop here, I loved the colours and architecture! 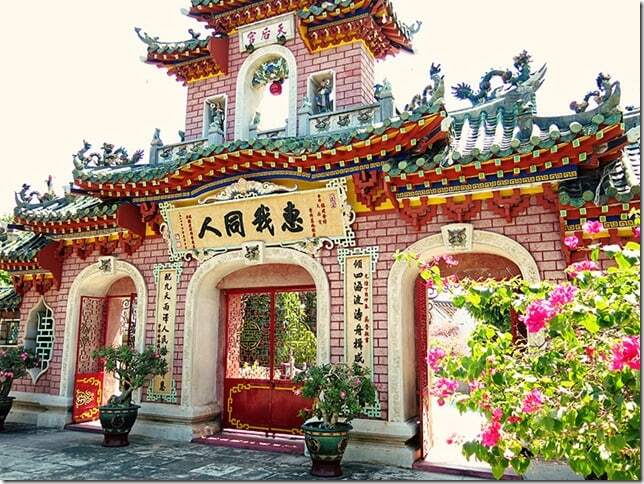 Stories tell that this assembly hall was turned into a temple for the Goddess Thien Hau, goddess of the sea. A goddess that kept the Chinese safe on their travels to Hoi An. The gardens, the architecture, the sculpture, the temple itself are all sure to impress! Located at point 101 on your map. 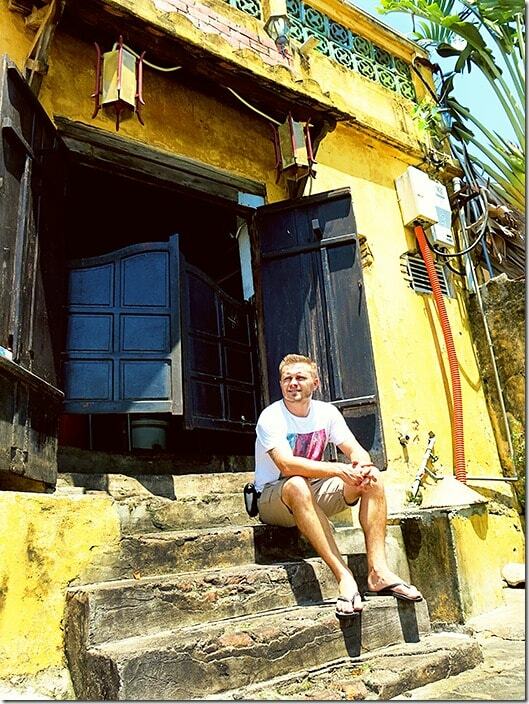 There are several old houses in Hoi An, we only visited this one so can’t compare them to the others. We did, however, enjoy our little tour through this old house! At the entrance, you will be asked to take a seat on some of the furniture that would have been used back in the day. Beautiful furniture!!! Here you will wait until one of the guides bring you some tea before taking you on a very short, brief tour of the house. We were told that this house had passed down 7 generations, and little change has occurred to the house since (except for preservation). The house is pretty dark as there are no windows, however, the center courtyard has a beam of sunlight illuminating all designs found here! The tour is short as you cannot enter the second-floor area (which is where the family lives). Tip: I have read reviews of the guides trying to sell you all the trinkets and souvenirs found at the back of the house, however, we politely declined and was not hassled further. Located at point 24 on your map. This temple was built in 1653, during this time the city had many Chinese merchants. 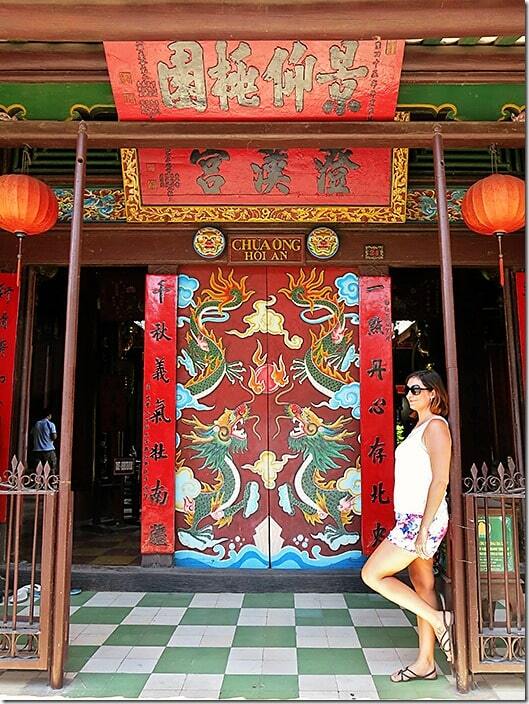 The Chinese architecture is pretty evident in designs and colours throughout Hoi An. We did not enter this temple, we loved the outside design and had a peek inside, however, left our ticket for some of the other highlights of Hoi An. Definitely worth a stop at though if only to see the glory of the outside design! The atmosphere you find at the Japanese Bridge is great to see! The bridge itself is small and located over a narrow mucky river, but the design of the bridge is gorgeous, the atmosphere is delightful. We highly recommend that you visit this bridge both during the day and at night. To actually cross over this bridge and visit the room and shrine found there will cost you an entry from your ticket of 5 free places to visit. We decided not to bother, but when we returned at night time we had a wander over the bridge and nobody confronted us to show our ticket. 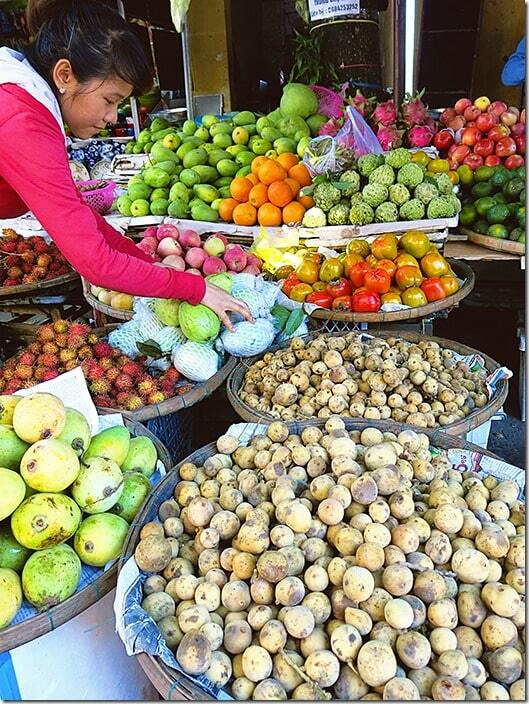 Central Markets are worth a brief visit, especially if you haven’t been to other markets in Vietnam. We loved the atmosphere, the buzz of busyness at the markets. We loved checking out all the local produce on offer. We didn’t stay for food here as we already had had lunch, but have heard that the food here is really yummy too!! 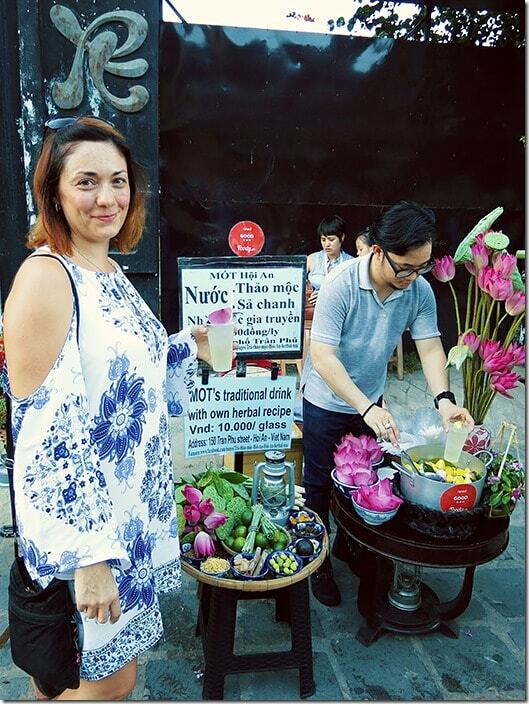 Tip: Read more about a Vegetarian Food Tour through Hoi An. Over on the other side of the river, you will find the night markets and the Hoi An lantern street. Here you will find pretty much the same souvenirs and trinkets that you will see throughout your travels of Vietnam. 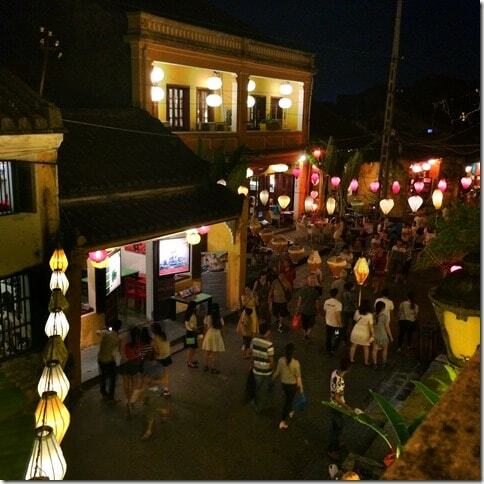 Hoi An at night – Hoi An lanterns. However, you will also find the lantern stall that everyone takes photos of! There are about 5 stalls there that offer a truly gorgeous sight of lanterns for sale. Trust me that these lanterns are that popular that you might need to fight your way towards the lanterns in order to get a photo! Make sure you go and visit! The view from the side of the river over Ancient Town is truly spectacular at night and you will find a whole range of cafes and restaurants too. Last but not least we need to mention the Lantern Festival. 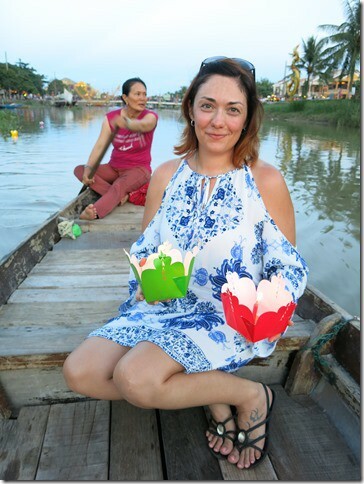 Hoi An is well known for its paper lotus-shaped candle flowers that you can send floating down the river to who knows where. We made the effort of seeing this all happen on a larger scale at the official Full Moon Festival and boy was it a crazy night!! The amount of people who pour into Ancient Town for this festival is incredible, the vibe is contagious! The little boys pounding away on their drums and running around in dragon costumes are a joy to watch! And by nightfall, you will see hundreds of these paper lotus lanterns filling the river with colour and light!! It was truly impossible to capture! I tried, I tried so hard!!! But had no luck! All I can say is, if you have the choice of being in Hoi An on one of these festivals, do so! As you will get a very different experience of Hoi An compared to the normal ones! We loved it! Ms. Vy’s most famous restaurant, Morning Glory is one of the top restaurants in Hoi An offer a gorgeous selection of traditional dishes. The setting is beautiful, we headed upstairs and was lucky enough to get a seat on the narrow veranda overlooking the busy streets below. Our favourite dishes were the deep fried fish and the cinnamon beef stew and both were totally delicious! 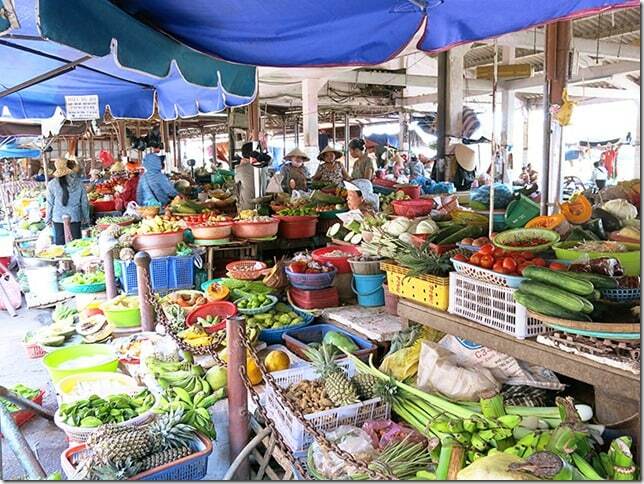 And if you are searching for a cooking class in Hoi An, then this is the best pick of the bunch for you! Hoi An Morning Glory offers cooking classes daily. 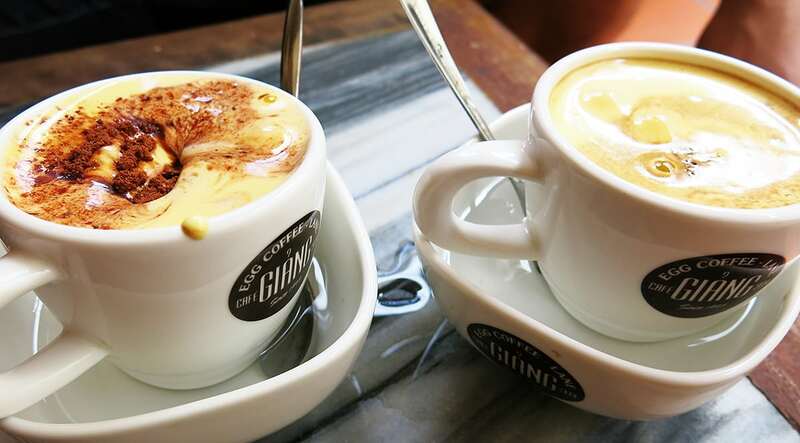 Another favourite restaurant of ours is located only a few doors from Morning Glory Cafe. We loved the food there so much that we went back for more another day! On both occasions, we had the Hai Cafe Charcoal Chicken with Morning Glory as a side together with BBQ Lemongrass Beef (Wrapped in banana leaf) with sautéed vegetable as a side. Their cocktails are gorgeous and so are their iced coffee’s as well! Highly recommend them! We also recommend getting into some of the local street food! Get to experience what it is like sitting on those tiny plastic stools. We also gave the deep fried sweet potato cakes a try (they were okay but we did not fall in love with them to any degree), as well as standing in the line for the famous traditional herbal drink man. Of course, Madame Khanh Banh Mi gets lots of raves too! We actually walked there suitcase trailing behind us for lunch and even though we got there at 12:30, she had run out of ingredients, so never got to try out the famous Madame Banh Mi. If you wish to stay where it is cooler and where you can enjoy a breeze, why not have a read of our review of Victoria Hoi An Beach Resort & Spa located at Dua Cai beach. We preferred staying here to escape the ridiculous Hoi An heat and just catch their free shuttle bus into Ancient Town when the need to explore hit!! We did also stay one night in River Suites Hoi An Hotel and had a beautiful stay there too if you do feel the need to be within walking distance from the Ancient Town. 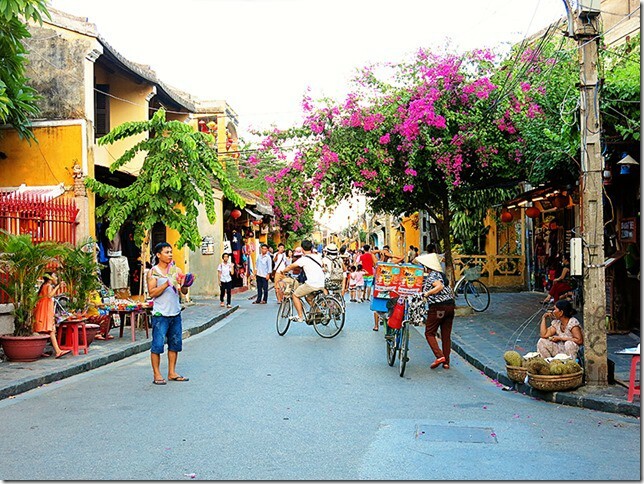 Why should you visit Hoi An Old Town? 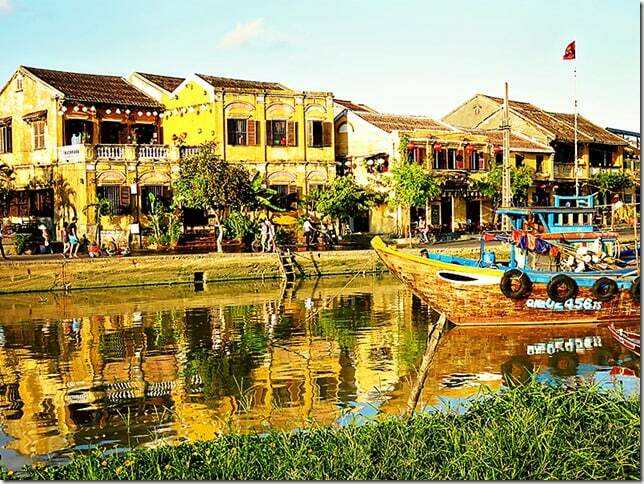 When you have such a beautiful piece of history to go and get lost in, why the heck would you not have Hoi An Ancient Town on the list of places to see? Should you be aware that Hoi An Ancient Town is pretty damn touristy? Yes, I think you should. Should you be aware that Hoi An Ancient Town is only a few streets big? Yes, I think you should! But there is also so much more to Hoi An to see and so much more to do than just merely explore and absorb the Ancient Town. And we have more posts to come on what else you can do whilst you are here! So go and jot this one down on your list! Go and see it, and come back here and tell us if you loved it as much as we did! 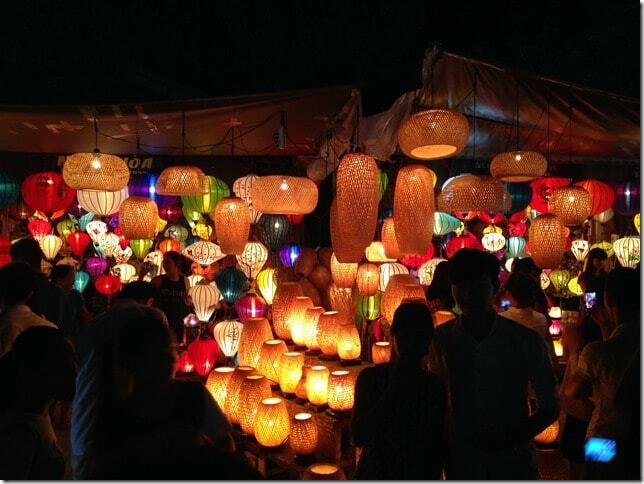 Before you visit Hoi An City of Lanterns! 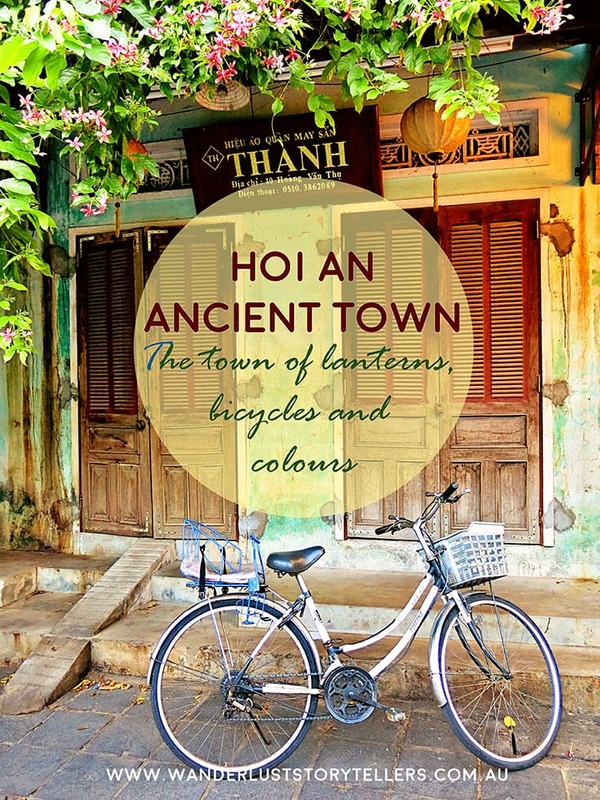 Want to know more about the enchanting Hoi An – Vietnam City of Lanterns? Why not buy some books to help you out with all the essentials whilst exploring Hoi An!? Of course, you can never ever go wrong with a Lonely Planet guidebook! Aren’t these just the best thing ever!!! Less than $9 for the Kindle version or $28 for the those who love the real deal. – at less than $7, this book will take you a long way! 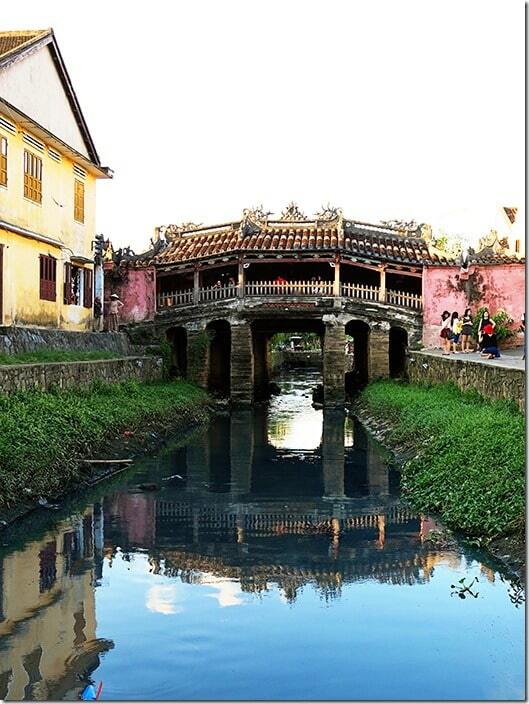 What grabbed you the most about the Hoi An Old Town? 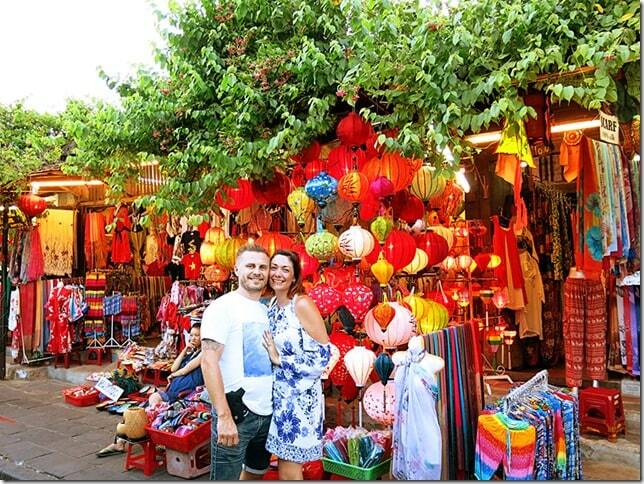 What colour lantern will you buy in Hoi An? If you would like to read about other things to do in Hoi An, why not come and explore the Hoi An countryside with us. Or why not escape to the Hoi An Beach in our post here. 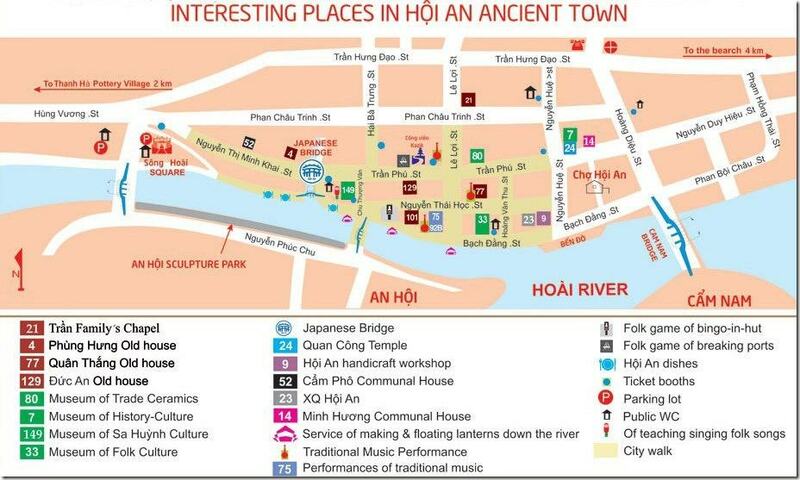 Or for a list of more ideas of what to do in Hoi An, click here. Check out the best Hoi An accommodation options here. And lastly, please help us grow by pinning this pin below!! Thank you!!! Please note that affiliate links are a part of this post, using our links doesn’t cost you any extra and will save you time! A Coffee Lovers Guide to Vietnam Coffee | Vietnamese Egg Coffee & More! Very comprehensive article about my town. Thank you very much, friends from Australia! Ah, so glad you love it!!! We truly loved exploring Hoi An, although think we need to go back for more more more!